Now that the NHL has gone ahead with the formality of officially awarding an expansion team to the city of Seattle, we can finally focus on more important things. Just what the heck is the team going to be called? The league’s 32nd franchise won’t begin play until 2021, but hockey fans everywhere are already eagerly anticipating its name, logo, and colour scheme. 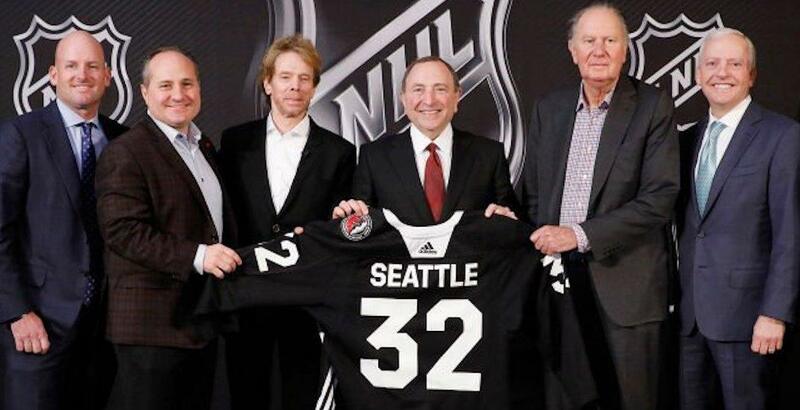 NHL commissioner Gary Bettman made his first visit to Seattle since awarding the franchise last month to discuss a number of things, including the team’s nickname. The new team name and logo is expected to be revealed sometime in mid-2019, King 5’s Chris Daniels reports. It certainly seems likely that the new team will go with a black and red colour scheme, judging by NHL Seattle’s recent branding. But the name? That’s been less clear. A year ago we discovered that the Seattle ownership group had registered 38 domain names, representing 13 different team name possibilities. Bettman appeared to discount “Metropolitans” last month, saying it wasn’t ideal because the league already has a Metropolitan Division. The name holds historical significance, as the Seattle Metropolitans won the Stanley Cup in 1917. He didn’t seem enthused by “Kraken” either, while “Totems” could cause trademark issues. Daniels connected the dots on a few comments by Bettman and NHL Seattle CEO Tod Leiweke, with Sockeyes and Steelheads appearing to be the new frontrunners. Gary Bettman spoke at length today about trademarks & the importance of them. Totems and Emeralds were the betting favourites just one month ago, with Rainiers and Kraken tied with Sockeyes for the next best odds. While fans in Seattle have certainly shown enthusiasm for their new pro sports franchise, selling 32,000 season ticket deposits, their neighbours to the north are excited too. Canucks owner Francesco Aquilini has been in full support of a team coming to the Emerald City. Just a three-hour drive south of Vancouver, Seattle presents the Canucks’ first natural geographic rival. Fans in Vancouver are expected to invade Seattle in large numbers when the Canucks come to town, as well as for other special league events. League officials have indicated that Seattle is likely to host the All-Star Game within seven years of playing, and the NHL Draft sooner than that. Bettman was less bullish on an outdoor game for Seattle, though a game against the Canucks at T-Mobile Park (formerly Safeco Field, the home of the Seattle Mariners) is a possibility given it has a retractable roof to guard against the possibility of rain.